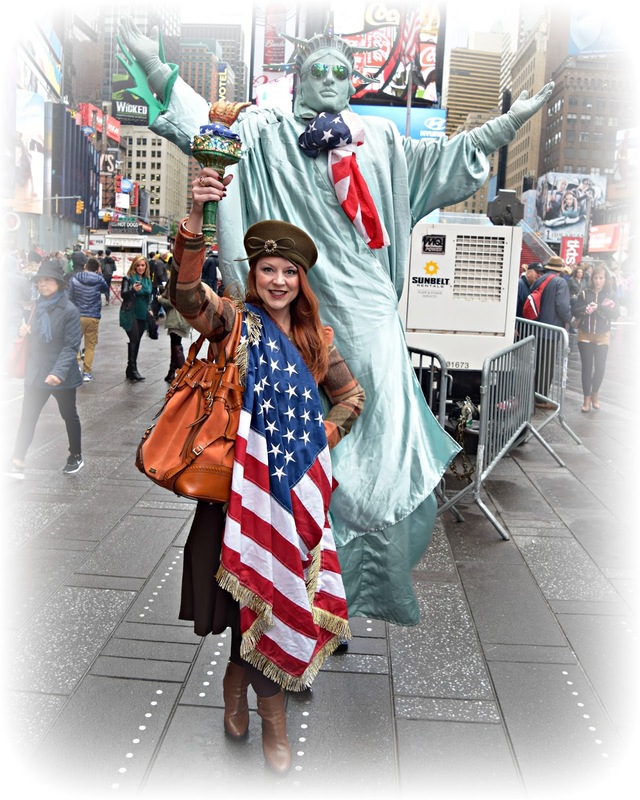 At the risk of sounding unpatriotic, I was annoyed when this Times Square street performer insisted on swathing me in Old Glory during a long weekend in the Big Apple last month. I recognize how blessed I am to have been born a citizen of this great country, but red, white, and blue just didn't coordinate with the autumnal hues of my ensemble. Didn't he realize I was trying to get a photo for this blog?! You have to admit that an olive green umbrella with burnt orange trim is a better accent for this outfit than Lady Liberty's painted plastic torch...it also kept me dry on a day dominated by drizzle. I was so glad I brought an umbrella. This one is from Nautica. The boots are Burberry, and were remarkably comfortable for an afternoon of sight seeing despite their height. As much fun as I had snapping photos all over the heart of the city that never sleeps, I didn't even consider pulling out a camera while visiting the 9/11 Memorial. It was my first time at the site, and I was not prepared for the overwhelming and complex emotions I experienced as I gazed into the reflecting pools situated in the footprint of the Twin Towers. It was a powerful reminder of how precious life is and how fortunate we are to live in a country where acts of war and terror are still met with outrage and not just as an inevitable part of our daily lives. So as I give thanks this Thursday for all the good in my life, I'll couple it with a prayer that we should all be so lucky. 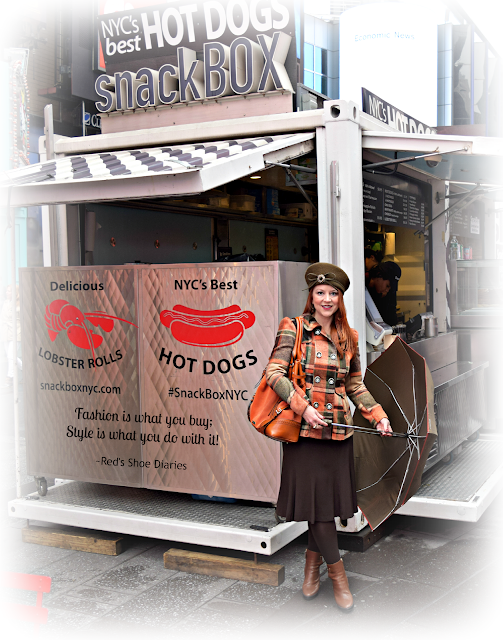 I couldn't resist adding a little Red's Shoe Diaries' "digital graffiti" to this Times Square food truck! Fashion is what you buy; Style is what you do with it! Great sense of humor infused in your beautiful commentary! 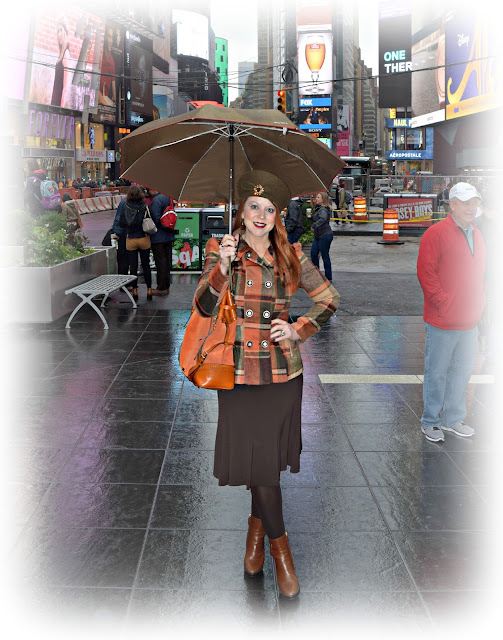 I love your autumnal ensemble and the joy that leaps from the screen as you enjoy NYC. 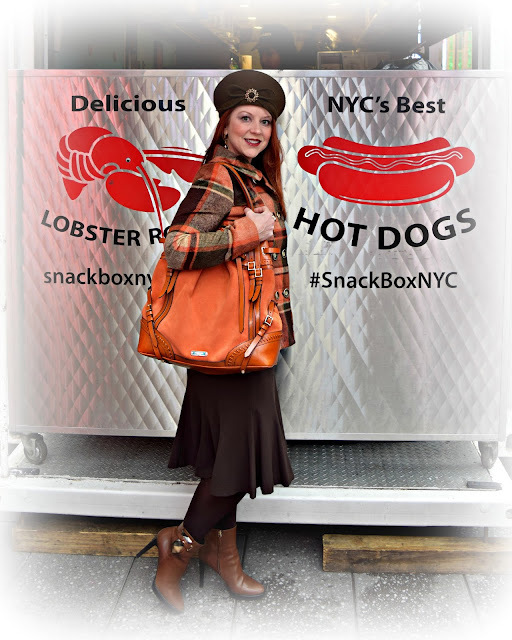 Thank you for sharing your embellished beret with Hat Attack!